Three down, one to go. Last weekend we attended another Adidas Next Generation Tournament, this time in Munich. Great arena, well organized event and very predictable ending. Loss to Ratiopharm Ulm in group stage was just a minor setback caused by already secured promotion and Real took the crown home to Madrid. Let’s take a look which prospect stood out, who played up to expectation and if anyone was disappointing. HENRI DRELL (6’8, Guard/Forward, Bamberg)– After disappointing opener, Henri totally exploded later at the tournament. Last two games we witnessed really memorable performances which gave him 7th best place of all time best scorers in single AdidasNGT tourneys as he went for 40 and 36 points respectively. Talent has never been questioned while speaking about Estonian prospect but his tremendous gift didn’t always pair up with concentration. Here Drell looked fully engaged, borderline overmotivated and was just feeling it. Basically his smoothness and offensive flow raised him to totally different level which none competition could reach. Bamberg player was creating shots with his significant right to left and between the legs combo dribbles, getting wherever he wanted with long strides and finishing difficult lay ups over help defense. Despite occassional FT problems jumper looked pure and whole shooting motion was one fluid process. Average strength and not overly suggestive frame may be small problem on next level. Moreover history of his performances prevents from getting too excited but if Drell can pick up where he left off in Munich for good then he is sure fire NBA prospect. MARIO NAKIC (6’7, Guard/Forward, Real) – Before tournament I wrote that Mario should prove himself as one of the best European prospect from his age group and he couldn’t do it any better than by leading Real to the title and taking Most Valuable Player award. Talented player already stands around 6’7, possess adequate strength and at least ok athleticism. He is opportunistic scorer with great understanding of the game. Excels either in half court and transition thanks to ability to handle the ball at full speed, long strides, body control and some advanced finishing moves. Super efficient player. Uses contact well for his advantage. Can get physical, puts his elbow on defender and then finds unusual way to score over him. Possess much above average pick and roll skills for a wing to create either for himself or teammates which is another desirable asset he provides. I also believe that his outside stroke is much better than the numbers suggests. Overall multidimensional, very skilled player with mature style and good tools. Euroleague prospect is very applicable in this case. USMAN GARUBA (6’8, Forward, Real) – Made Nakic’s MVP award at least questionable. 2002 born Spanish player already needs no introduction in wordwide youth basketball circuit. After dominating FIBA U16 European Championship as two years underaged player he continiues to shine with his unmatched tools in more reliable age group to evaluate prospects. However opinions are divided of what future holds for Usman. For some he is clear cut NBA prospects and next best thing from Europe while others question his productivity on the highest level. I belong to the second group. Usman already reached his physical peak and is not even 6’9 in shoes. He benefits mostly from O’neal-esque strength or Zion Williamson type of body if you prefer this term. He runs the floor hard but attacks more with brawn than burst or bounce. So beside imposing built he is extremely short center or power forward who doesn’t show ANY promise of shooting skills and possess very, very little perimeter game. His feel is average and assists are made mostly in fast breaks in well spaced floor where it’s easy to execute advantage. With tools and mind blowing power that Garuba is blessed with he will still be able to mark his presence on high level but I don’t see a reasonable NBA fit or chance to ever be impactful rotation player at that level. NIKOLAOS ARSENOPOULOS (6’5, Guard, Olympiacos) – Obviously not a discovery as he was one of the best players of Greece U16 back in the 2016 at FIBA European Championship in Radom. Nikolaos also has already made his debut with Olympiacos pro team. This tournament was his breakout performance and he showed enough potential to consider him soon to be full time rotation member of Greek powerhouse. Arsenopoulos is definitely not lean and lacks speed especially on defensive side of the court. However he makes great usage of possibilities that his body gives him. He possess great balance and ability to withstand the contact. Good understanding of the game shows also in choosing right moment to explode which allows him to blow defender by with not much burst. This combined with positional size, handles and craftiness as far as abilities to get downhill and finish go, make him a real scoring threat. Besides he is very good long distance shot maker and can share the ball in unconventional way. Highly skilled player with but somewhat passive off the ball. Non vertical – can hit the wall at times. Plays a bit like out of shape Belinelli. FRANZ WAGNER (6’7, Guard, Alba) – Not just a Mo brother. With other surname would deserve equally big attention and admiration of his tremendous potential. His body is filling out very nicely and he is definitely not done growing which may be the reason why explosiveness is still yet to come. Most of the time play as off guard concentrated on spot up shooting which changed in the last game. Despite a bit low release point, form was very repeatable, quick and effortless. Franz is really becoming specialized shooter and in worst case scenario will end up as high level player who takes this role on the court. However he have much more given size, good handles and decent playmaking ability. Considerable NBA upside. ALEKSEJ POKUSEVSKI (6’10, Forward, Olympiacos) – You cannot only stay indefferent but it’s hard not to love the combination of size and skills that belongs to Pokusevski. At 6’10 he possess real playmaking qualities and reliable, good looking spot up & pull up stroke. Handles are really nice and he shares the ball with vision and proper timing. However his tendency to become one dimensional outside oriented player doesn’t really help him. He is very narrow in shoulders and definitely not built to fight. At this point is unable to use his height more as the advantage. Not an energizer type. MATE FAZEKAS (6’11, Center, Ratiopharm Ulm) – He may lack the foot speed and be too chubby to have any NBA chances but still is very exciting prospect for high European level. Pick and roll defense is big problems where he is slow to recover and gets punished by quick guards who excel in two man game. Very smart player with all proper instincts. Can really shoot it with three point range. Creates for himself in post up situations with polished footwork either in the paint or on the perimeter where he is capable of making turnaround jumpers. Gets leaner and leaner but doesn’t look like the type of player who easily stays in shape off season. ANDRZEJ PLUTA (6’3, Guard, Sevilla) – Polish guard displays tremendous offensive skillset. He creates shots off the bounce easily thanks to fantastic footwork against longer and overall very good defenders on his position. Has a really wide repertoire of combo dribbles, solid quickness and is able to change his speed. Obviously he has the scorer mentality and really falls in love with his shooting (attempted 43 3s in 4 games) maybe even a bit too much at times. However Pluta is also capable of sharing the ball. We didn’t have a big sample of this skill in Munich as most of the time he played next to Da Silva as pure shooting guard. This is the role that will be hard to take full time in very good pro leagues for Andrzej regarding his size, average length and slightly narrow built which is moreover in very advanced stage. KAY BRUHNKE (6’6, Guard/Forward, Bamberg) – German prospect with Polish roots was good not great but did a lot for his team if we take under consideration that he was recovering from illness. First game was clearly the best player on the floor but later run out of gas a little in this intensive tournament. From physical standpoint Kay looks much more mature now but what stands about about him even more is how advanced understanding of the game he has. At 6’7 he plays as point forward, shares the ball with style including cross passess off the dribble. Moreover shows some leadership qualities and is great communicator on the floor. On the other hand could be more explossive. Don’t really see NBA chances but it’s easy to picture him having long succesful career on high European level. JOSHUA OBIESIE (6’6, Guard, Bamberg)– This name is really trending and picking up recently. Was unknown outside of Germany until we watched him in Prague at GBA Invitational few weeks ago. In Munich made more impact on Brose team than three other loaned players combined. Exciting to watch and energetic. Creates his own offense comfortably. Very nice positional size and athleticism. Plays defense. Just very left handed. JASON GEORGE (6’7, Wing, Ratiopharm Ulm) – If someone wanted to produce documentary about Jason George it could be named „The jumpshot away from being NBA prospect”. Ratiopharm’s talent possess highly desired profile for highly desired wings nowadays. Standing around 6’7 with what seems to be good wingspan, he is much above average athlete for European standards. He is energetic player who crashes the glassess, is willing to play defense and outruns opponents in transition. Moreover he shows flashes of solid feel for the game visible in weakside cutting and moving the ball within offensive flow in half court. His touch on runners or Free Throws doesn’t look bad at all but somehow he seems to have extremely long ways to go as a shooter. Can miss open looks badly. If he converts those airballs for nothing but net shots then sky is the limit. JONAS MATTISSECK (6’5, Guard, Alba) – Good not great tournament for Jonas. Offensively probably there is a level which he cannot jump over and he won’t become more than ok Beko BBL scorer. His stroke is very fluid looking, he can make misdirection steps while driving to the rim. Besides his size and frame allows him to mix both guard position responsibilities on either end of the floor. We all know how pesky defender he is but we shouldn’t underestimate his tremendous instincts. His ability to press is combined with predicting opponents moves. He had multiple steals which made other promising guards looked extremely naive. Berlin native, team player, brings intangibles to the table. Seems like a perfect long term rotation player of Alba. HENDRIK DRESCHER (6’9, Forward, Alba) – Great weekend for Alba frontcourt prospect. Surprisingly he was one of the best players running in Audi Dome. However for scouts best player rarely means best prospect. Drescher has to be appreciated and respected for how big strides he made to adjust to the modern basketball. He stretches the court more and more reliably and even made occassional drives or quite athletic finishes for such a heavy footed guy. However his ball sharing was total game changer for his team. Almost 4.5 assist per game is something that most likely even Alba staff wasn’t expecting. Upside is still limited but if he keeps working that much on body and game then he may earn solid money from basketball. AMAR SYLLA (6’9, Forward, Real) – His arms seem longer than sight can reach. Possess wide shoulders and his frame is getting toned. Plays a bit different than typical African players with his length though. Much more fitable for 4 position. Will never do Anthony Randolph kind of things but perimeter shot is not broken and he can make simple one dribble mid range drives. Even feel for the game which shows in passing and concentration level is ok. If it is real that he won’t turn 17 for the next 8 months then wow! 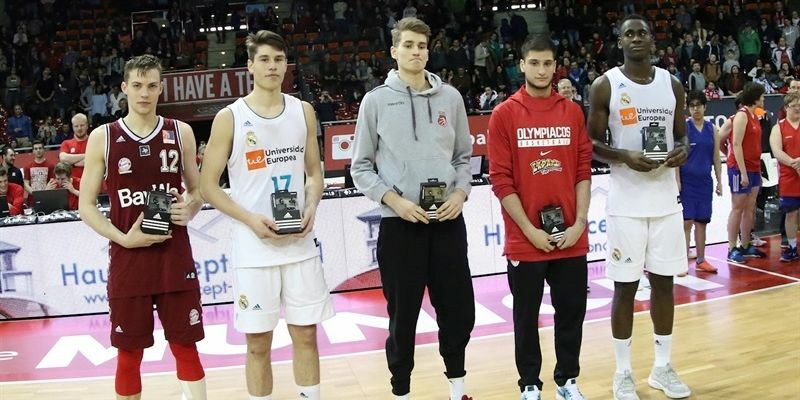 KILIAN BINAPFL (6’5, Guard, Bayern) – All Tournament Team member and huge reason why Bayern participated in the final game. Does great job posting up guards or small forwards. Not greatly talented but makes his presence felt on both sides. Has athletic frame with wide shoulders. Plays simple but very efficient game. Attacks closeout, takes part in transition, looks for the spots off the ball. Plus defender and good rebounder. As pro just a role player who needs to develop outside shoot. TIBET DENIZ GORENER (6’8, Wing, Darussafaka) – 2002 born Turkish prospect who headlines this generation in his country exposed his huge potential in blowout lost against Real Madrid. Besides he struggled to produce and had limited role in the team. However anytime he stepped on the court played without any respect and it was not difficult to notice his upside. 6’8 with well proportionate frame, fluid athlete who has sweet stroke. Can very well become one of the best European wings in this age group. MERT AKAY (6’5, Guard, Darussafaka) – Turkish 6’5 guard made a phenomenal physical progress. His shoulders looked really broad and toned. Basically he currently displays close to elite strength on position but didn’t lose anything from his smoothness and still prefers creative, finesse style of playing. However more bulk means more fearless penetrations, ability to finish through contact and bigger rebounding contribution which is big added value to his overall skillset. In average Dacka team Mert played a lot as SG and was making pull ups from anywhere on the court but 3pt and FT percentages could be higher. He recorded triple double in 5th place game and after this performance can be considered arguably Top PG prospect from his generation and is destinated to have bright future in Turkish Euroleague teams. TIMO LANMUELLER (6’3, Guard, Ratiopharm Ulm) – Offensive minded guy with relentless attacking style. Kinda lives and dies because of that. Definitely not a true PG which decreases the ceiling. 6’3 with just adequate frame but has motor and scoring instincts. Will be very good bucket getter in every youth basketball setting but doesn’t seem overly translatable for pro basketball. Probably solid mid/low Beko BBL level or small role with Ratiopharm seniors. TOMAS BALCIUNAS (6’8, Forward, Sevilla) – Packs solid amount of pounds and his very well built frame works wonders at U18 level. High level rebounder on either end of the floor. Gets physical and throws body around to clear out the space. Just average size and not that good athlete. Came to Spain as youth categories star but has chances to participate on high pro level only as a role player. Kind of throwback post up heavy 4 position guy who defends on the perimeter strong. Shots mid range but nothing more further. Below critical level 1/7 on threes and 13/28 from FT line. SASHA GRANT (6’6, Forward, Bayern) – Very positive showing. Super strong player. Quite maximized but his ripped body and tools will stand out also on next level. Excels in slashing and aggressive defense but 3 and D is more desirable than slash and defend. Sasha’s stroke is very irregular and has noumerous flaws. Basically he is limited to catch & explode plays. He is unlikely to ever do crafty things on the court and has no wiggle with the ball. Without getting his shot right or 1-2 more inches which he is unlikely to have left, it will be hard to slip into high level pro consideration. LUC VAN SLOOTEN (6’6, Forward, Bayern) – Beside the first good game German Top prospect really struggled later in the tournament and was getting frustrated when things didn’t work the way he wanted. His greatly improved shot wasn’t falling (just 3/19 3pt). However he is still 15 years old and I wouldn’t overreact and draw far-reaching conclusions. MATEJ RUDAN (6’7, Forward, Bayern) – Terrible showing but had health problems which he missed two games because of and couldn’t present his full potential.